After the process of site location and protection through registration is underway the next priority might well be identification of these sites by name. A E Jones makes an admirable attempt at this process and given the resources at his disposal at the time his triangulation theory was not a bad idea. His analyses of each village name in order to find reference to its location or geography is well beyond my capabilities in linguistics and can be left to others to review. I don't speak or read French, failed miserably in Latin and have a hard enough time with my native language as may be noted by my spelling. 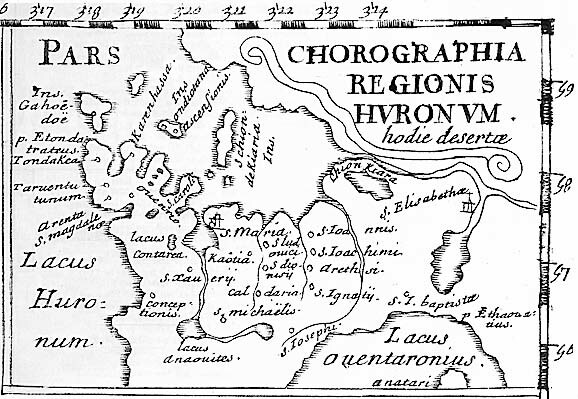 Jones did however do what I have wanted to attempt and that is put the various villages that are mentioned in the Champlain, Sagard and the Relations into order and position based on the numerous trips and resulting itineraries of the explorers and priests. This work then allows one to identify some sites by the type and age of artifact found and connect the dots to the next site in line on the itinerary. This process will be an interesting one for me as I am sure it has been for many before me. I will have the advantage of another 100 years of research and digs that Jones and Hunter did not have available to them as well as a large scale (1:50,000) detailed map of Huronia (8'x6') that along with my GPS may enable me to connect the dots and put place names to patches of ground where families lived, people were born, died and berried and a civilization flourished a full 200 years prior to our communities taking root in this same soil. I will however be faced with my first posted problem; Where is Toanche? I don't know where Toanche is. BUt I would love an 8'X 6' map of the area- Where can I get one? Thanks John for your work.